How Progressive Are Our Taxes?, Consider the Evidence: Steven Dubner has a post on the “Freakonomics” blog titled “The next time someone tells you that taxes are not progressive…” He relays information from a new Congressional Budget Office (CBO) report, via Greg Mankiw, which lists effective federal tax rates for households at various points in the income distribution. The rates are higher for those with larger incomes. The implication is that our tax system is quite progressive. But it doesn’t make much sense to look only at federal taxes. State and local taxes account for about a third of total tax revenues, and they tend to be less progressive than federal taxes. If we take into account all taxes — federal, state, and local — the effective tax rate for the well-to-do is only a bit higher than for the poor. Here is one way to see this, based on data from the CBO and the Tax Foundation. 2 Responses to "Are Taxes Progressive?" The LSD must have kicked in. This is more of the popular “look over there” argument that does not direct itself to the question at hand. It confuses the issue by answering a related, but un-asked question. 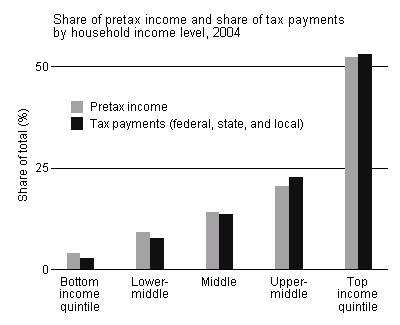 First, federal taxes ARE progressive; do the math. The attempt to use charts and fiures seems to come from the “figues don’t lie; but liers figure” school of politics that contributes nothing toward real solutions.To call Mark’s logic crap would elivate it.